This essay was previously published on Parent.co. We went camping for the first time as a family this past weekend. I went camping for the first time this past weekend. Like at a campsite, in a tent, in sleeping bags, on the ground, camping. Travis had wanted to go camping for some time. 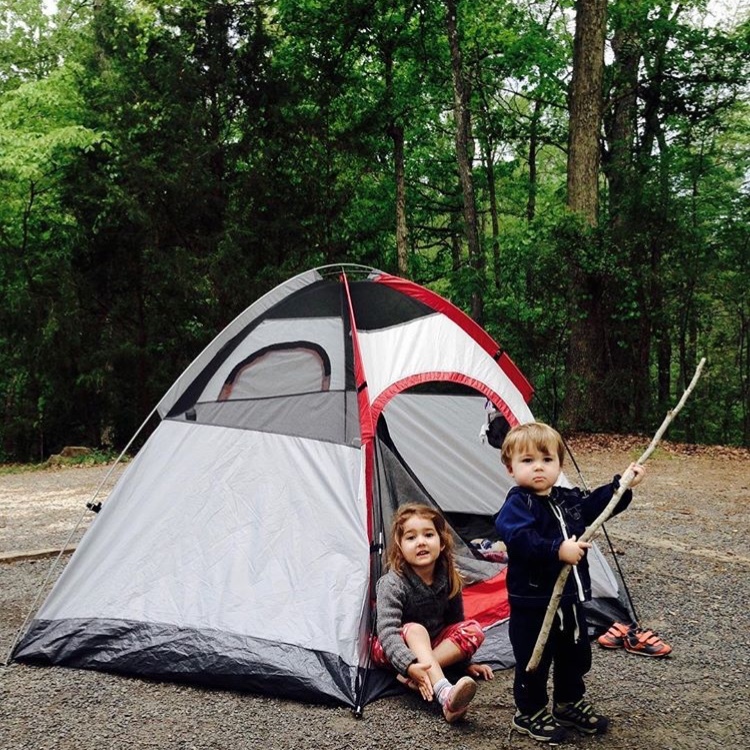 He wanted it to be “our thing.” He wanted our family to be a camping family. He was putting a lot of stock into this dream with a wife who had never camped before and the unpredictable nature of the weather app. “I’m going to take Anna camping for her birthday,” he told me back in September. Secretly I was relieved he didn’t invite me on their father/daughter trip. I wasn’t so sure I was ready to be among the bugs and the dirt and sleeping on the hard ground just yet. He made reservations at a campsite at a nearby lake. Anna’s third birthday came, and with it, a storm that was to last all weekend. They moved their camping trip indoors and set up the tent in our tiny living room. She had a blast. She had no idea this wasn’t real camping. But Travis did. He was ready for the real thing. He longed to be sitting by the fire roasting marshmallows and hot dogs, falling asleep under the stars, and waking up to the birds chirping and the cool air filling his lungs. And he wanted to experience it all with his family. Autumn left without another camping trip planned. Winter was cold, as usual, but living in the south we knew it wouldn’t be long before spring brought warmer temperatures. Travis spent December through February researching the best tents, sleeping bags, and other camping gear out there. Who knew there was something called a mummy wrap to keep you from freezing to death while you sleep? He set up a trip in February to go with a good friend. They went backpacking for two nights. He was very thankful for that mummy wrap — without it and a few other pieces of clothing he might have actually frozen to death. After that experience he was more ready than ever to introduce his family to the great outdoors. I told him we needed to wait until the weather app told us the low would be higher than 50 degrees. But he lived for the open air and the surrounding trees. He was suffocating in the urban jungle of Charlotte. At the beginning of each week starting in March, Travis would check the weather app for the following weekend. For six weeks the low was less than 50 degrees. He began growing weary. Until the weather app brought great news — at least, great news for him. He reserved our spot on Lake Wylie, we gathered all our supplies (sans mummy wrap because you don’t need one when the low is higher than 50 degrees), and we loaded the car. We were going camping! Excitement filled the car but my expectations were low. Since I had never slept in a sleeping bag on the hard ground, in a tent, outdoors, with nothing but mesh between the elements and me I didn’t know if I’d wake up with a crick in my neck that would last for the next week. I feared what it would be like for Anna and our son, Theo, who was barely a year-and-a-half. Would Anna be startled by the sounds or scared of the dark? Would Theo toss and turn all night, waking up at all hours and impossible to lull back to sleep? I wondered what Travis was really thinking taking his young family into the woods. As soon as he reminded me of conversations with friends who have taken their kids camping and survived, I trusted him and began eagerly anticipating the unknown. Pulling into the campground I was relieved knowing we weren’t the only young family to leave the comforts of our home to brave the outdoors. Moms and dads were pitching their tents or making their RVs ready while kids ran through the trees and down by the playground. We parked the car at our own campsite and I immediately noticed how peaceful it was with the trees enveloping our little space. We were far enough away from the other campers but close enough to the playground and bath house to make me feel like we weren’t in total seclusion. I stepped out of the car, and after feeling the crunch of the gravel beneath my feet I looked up at Travis. That’s all he said. That’s all he needed to say for me to remember we weren’t at the Hilton. He would’ve said it was better than the Hilton; the verdict was still out for me. Not even 30 minutes later our kids were playing in that gravel. Dirt so thick on their little bodies, dirt so embedded under their tiny fingernails, I cringed knowing a bath was still 24 hours away. I carried the baby wipes around with me, following their every move, wiping and scrubbing the caked on dirt to no avail while Travis sat in his chair enjoying his surroundings. “Jess, just breathe,” he reminded me again. He was right. I needed to breathe. I needed to remember that the wilderness calls for dirt under your nails and dirt in your clothes and dirt everywhere. It was going to happen regardless of whether or not I ran at the heels of my kids with a baby wipe in hand. Why was I fighting it? I know how important it is for kids to play outdoors, getting dirty, feeling the earth, playing with sticks and bugs, building castles made out of rocks. Exploration. Feeling. Sensing. This is how they grow. “We’re going to have to clean them with soap and water before we eat,” I told him. “Just breathe.” The baby wipes sufficed. “We should have them take a shower in the bath house before we get in the tent for the night,” I recommended. “Just breathe.” The shower was nixed. We fell asleep under the stars. We were dirty. All of us. We smelled of fire and smoke and the great outdoors. Before I closed my eyes for the night I peered over at my sleeping babes next to me. Anna’s face was smudged with dirt and leftover marshmallow from her s’mores. Theo bore a welt on his forehead from a fall he took earlier off the picnic table and his fingernails were caked with earth. As I drifted off to sleep, I breathed for what felt like the first time that day and decided camping wasn’t so bad after all. We were stirred awake the next morning by the birds chirping and the sun breaking through the trees illuminating the inside of our tent. We survived the night! I took a deep breath allowing the fresh, cool air to fill my lungs. I was determined to let my kids get as dirty as they possibly could that day knowing we would leave in a few hours to return to our home and bubble baths. And they did. Later that evening I held Theo close as I nursed him in our chair. After a night in the wilderness it felt good to be back among the familiar. Taking a deep breath I let the heavenly scent of Burt’s Bees baby shampoo overwhelm me. I took his hand in my own. The earth that was once caked under his fingernails had been washed away. No trace of camping left on our bodies. Travis’ words echoed through my mind. He knew that was all it would take for me to enjoy our first time camping as a family and to allow my kids to experience the great outdoors in all it’s glory. I loved this, Jess! Such a fun read! I'm Jess. I write to share stories, I write so I don't forget, I write to process all the scrambled thoughts swirling through my head, and I write because I’m the worst at talking. This is where I do all that. all rights reserved. you may not take any content from this site without written permission. Powered by Blogger.